Hanuman Jayanti is celebrated on the fifteenth day (Purnima) of the brighter lunar fortnight (Shukla Paksha), during the month of Chaitra to commemorate the birth of Lord Hanuman. Also known as Maha Chaitri, it is a golden opportunity for the devotees to pay their reverence to the Vanara God. This year, Hanuman Jayanti will be celebrated on April 11, 2017. Lord Hanuman is one of the most venerated Gods of the Hindus. Born as a Vanara to Anjani and Kesari, he possessed immense supernatural powers right from the beginning, and is considered as the symbol of strength and energy. Regarded as the eleventh incarnation of Lord Shiva, Hanuman is also dignified with the name Pavanputra, meaning the son of wind, as the Wind God Vayu played a major role in his birth. Lord Hanuman is one of the core contributors in rescuing Maa Sita, and defeating the demon king Ravana. He wields a mace as his weapon, and is known for his ability to shapeshift, infinite strength, perseverance and unfaltering devotion to Lord Rama. Hanuman Jayanti is celebrated by the devotees with unswerving devotion, and they visit Hanuman temples to pay reverence to the mighty deity. They apply tilak of sindoor (Vermillion), taken from the idol of Lord Hanuman, on their foreheads. The celebration starts at dawn, and continues till sunrise, after which the Prasad is distributed to everyone. 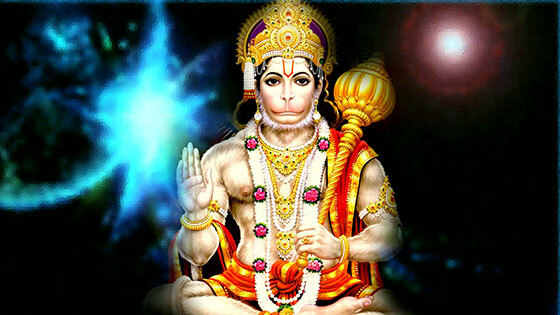 It is believed that chanting Hanuman Chalisa on this sacred day proves to be very good to get ward of all sort of problems. People observe fast, and offer prayers on this day to appease Lord Hanuman and seek his empyrean blessings. We wish you a very happy Hanuman Jayanti, and hope that Lord Hanuman bestows upon you, all his divine blessings!